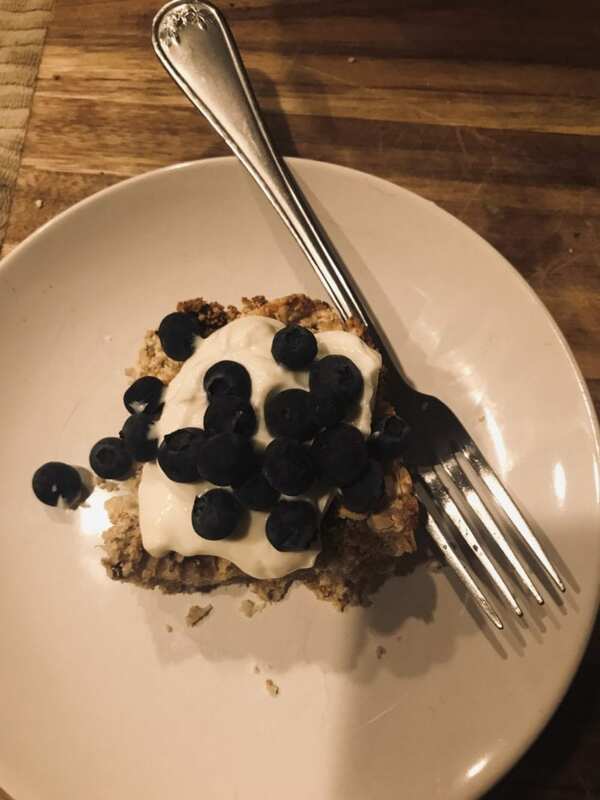 Welcome to our 2019 Reader Diary series where we are going to be sharing success stories + what people ate for a week! We are still accepting entries, and those who are featured will receive $50 in groceries from Thrive Market, 2 of my cookbooks, and a free Prepear meal planning program membership for a year. Get all the details (and share your entry with us!) on this page. Hello! We are the Brees Bunch, and we live in Southern California. 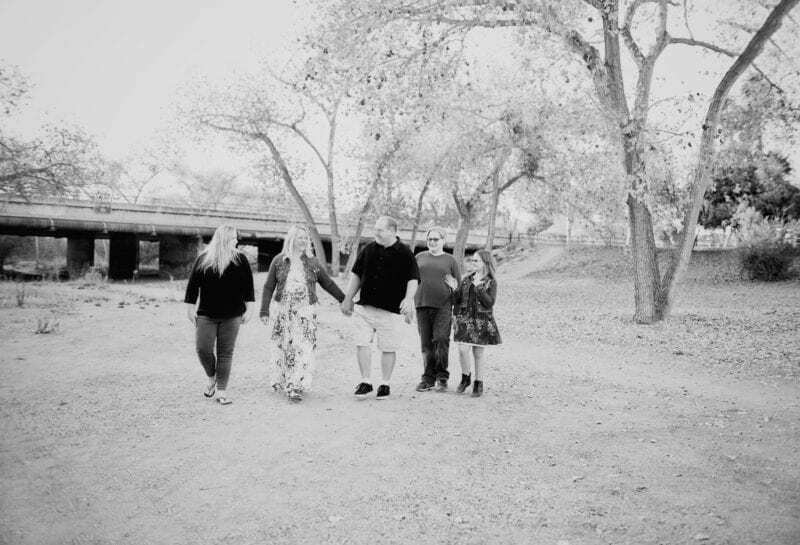 We have three children ages 17, 15, and 9. Both my husband and I work full time, but with opposite schedules. He’s a professional musician, and I’m an instructional coach. We have a lot of food concerns in our family, so we’ve been slowly introducing real food since January 2017, but really started committing to it in September of that year when our daughter was diagnosed with ADD. My husband has Type 2 Diabetes and needs to eat lower-carb. He detests any type of seafood. My 17-year-old is a vegetarian but will eat fish occasionally. She has also been diagnosed with depression and anxiety. She has relied on heavily processed meat replacements instead of making vegetarian meals. My 9-year-old has severe ADD and functions better eating lots of healthy proteins and eliminating processed or sugary foods. My 15-year-old son has grown a foot this last year and is constantly hungry and usually turns to junk food to satisfy his hunger. And then there’s me—I’ve suffered from severe migraines for years and am always exhausted. Plus, I need to lose a significant amount of weight. We knew what was best for our family but felt that our tight food budget and busy schedules prevented us from doing that. However, there was a point last year when we realized how much we were relying on processed food or take out for the majority of our meals. Not only were we spending way too much money, we just didn’t feel well. Our house felt tense all the time. One evening, as I went up to bed feeling sad and frustrated, I made the decision to commit to purchasing and preparing food that was beneficial, not harmful. I began looking for ways to do that and still stay within a strict budget. I came across the 100 Days of Real Food site and began to read and implement great ideas, like using only whole wheat products and adding fruit and veggies to every meal. I’m also a big believer in making food ahead of time and doubling recipes to have food to freeze. It was a bit slow at the beginning, and some of my family members resisted. But the benefits have been awesome. I have lost 25 pounds from May – September 2017 (and an additional 15 lbs January 2018 to now!) and my migraines have diminished greatly! My youngest daughter with ADD has shown increased attention after we transitioned to whole foods and cooking at home. My husband has been able to maintain healthy blood sugar levels consistently for his diabetes. My vegetarian daughter is able to find ways to make real food instead of always purchasing packaged, processed vegetarian items. And, my son is able to satisfy his hunger by making snacks out of real food. We signed up for a CSA (Community Supported Agriculture) box through a local farm and shop at Costco once a month for our bulk purchases. We also purchase a large box once a month from Butcher Box, which provides meat that is humanely raised without antibiotics or hormones. Then, we plan weekly meals together as a family. I ask for suggestions for dinners and breakfasts. Our children are responsible for packing their own lunches. It used to be extremely difficult to plan lunches, since all 3 kids like different things. I decided to give each child a weekly set amount of money to purchase lunch foods—this would include an entrée, fruit, veggies, and a snack. We shop as a family once a week, and it has been awesome to have the kids plan, budget, and shop for their lunches. It gives them more freedom and they like trying new things. Plus, they are much more likely to eat the food they’ve chosen because it was their decision. In addition, they can use anything from the freezer or fridge if they get tired of the same lunch foods for the week. Sometimes, they will plan together and share foods. All 3 children help my husband, and I make meals at home, and our oldest usually cooks for the family at least once a week. Our meals are usually meat or protein-based, but we have side dishes that are hearty so that our vegetarian feels satisfied. We try to plan at least one vegetarian meal each week. 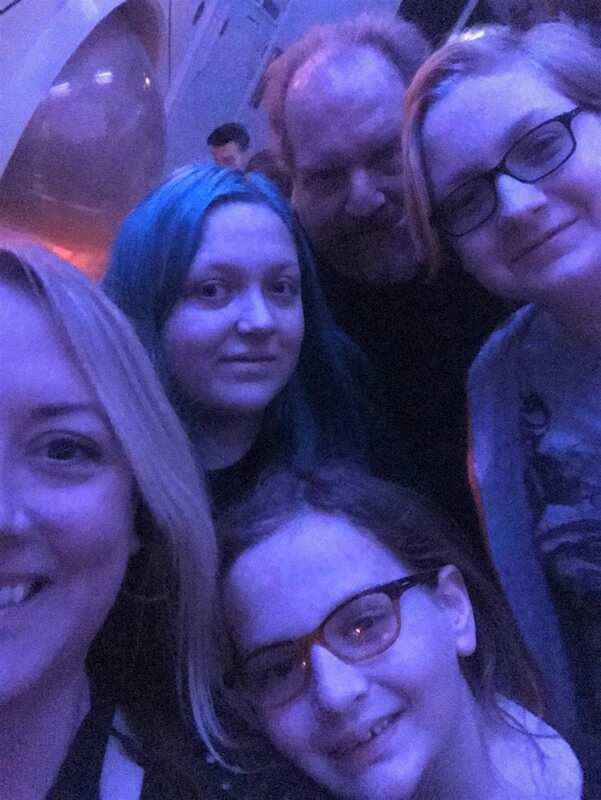 In January 2019, we determined as a family that our next step on our real food journey would be to eliminate any added sugar for 40 days to see if we felt any better. We decided we could use small amounts of raw organic honey or pure maple syrup if needed. We don’t have a lot of snack food—we usually have leftover breakfast items, homemade trail mix, fresh fruit, and nut butter, or hard-boiled eggs and veggies. For treats, since we’re eliminating added sugar, we splurged on Lara bars and fruit cups (in 100% fruit juice), just for this month. We’ve cut out buying juices and sodas over the past year, so our beverages are very simple. I drink black coffee in the morning and peppermint tea later in the day. My husband occasionally has black coffee in the morning and black unsweetened iced tea in the afternoon. Our kids usually have water or unsweetened sparkling water with dinner. For breakfast, 2 out of the 3 will drink organic whole milk, and the other will have organic unsweetened almond milk. We recently invested in glass reusable water bottles to encourage the kids to take a water bottle to school and hydrate! I had to have a chat with my 9-year-old when I kept noticing an empty juice box in her lunchbox. One of her friends was sharing her juice with my daughter every day. We had a great conversation, and my daughter shared she wanted something more than water with her lunch. She decided that a peach herbal unsweetened iced tea or sparkling water would meet her needs. 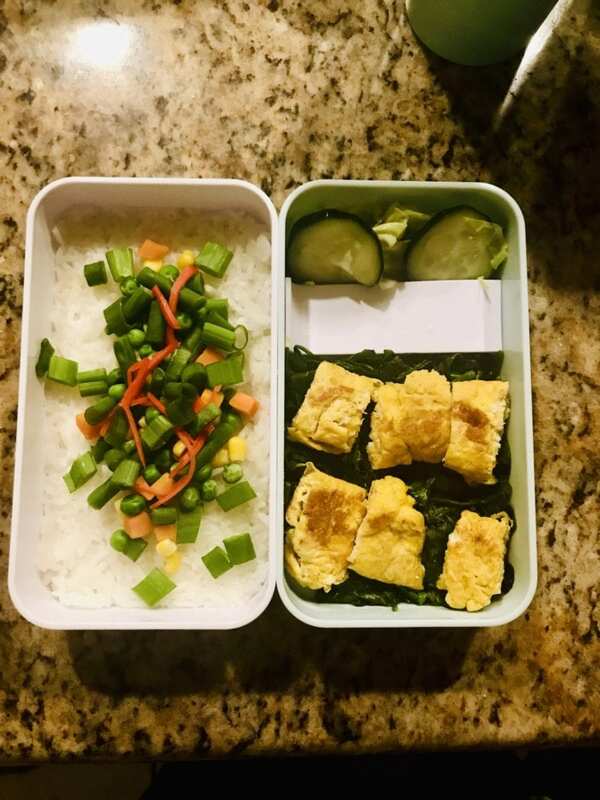 Our food diary is mainly what I ate throughout the week, but includes at least one lunch from each child, so you can see the variety and the choices they made. Breakfast: Chile relleno casserole, roasted potatoes and peppers, fresh fruit. Lunch: Tomato basil soup, grilled cheese sandwiches on sourdough bread. This is a typical meal after grocery-shopping. We usually try to have something simple since we shop after church and everyone is ready to eat by the time we get home. I freeze individual soup portions for lunches or snacks at a later time. 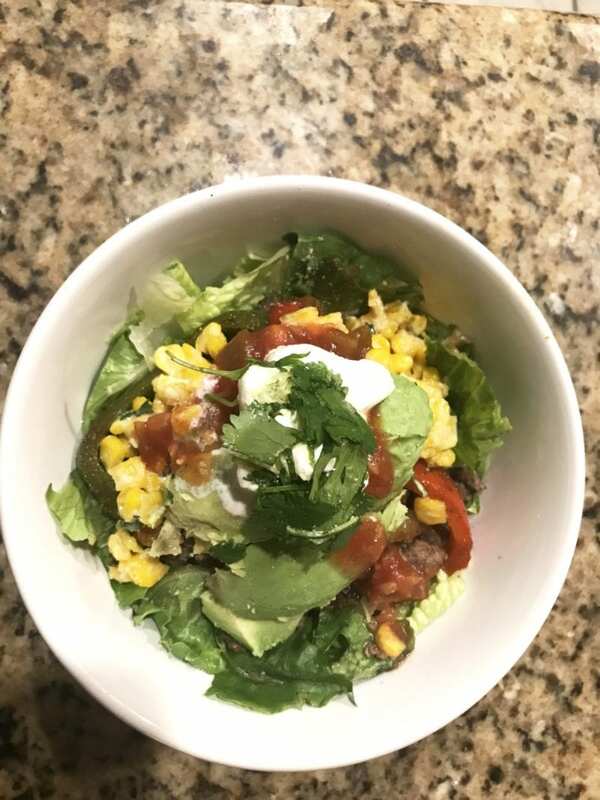 Dinner: Beef taco bowls: grass-fed beef, organic black beans, roasted street corn, sautéed peppers and onions, organic romaine lettuce, sliced avocado, sour cream, salsa. Taco bowls are great for our family since everyone can customize them to fit their needs. Breakfast: Broccoli-cheddar quinoa egg bites, grapefruit or mandarins. With our early mornings, breakfasts need to be ones that can be taken to go! Lunch: Homemade Protein Box: Almonds, cheese cubes, hard-boiled egg, fresh berries. During my work day, I don’t have time to eat a whole lunch so I usually pack snack-type foods that are easy to eat on the go. 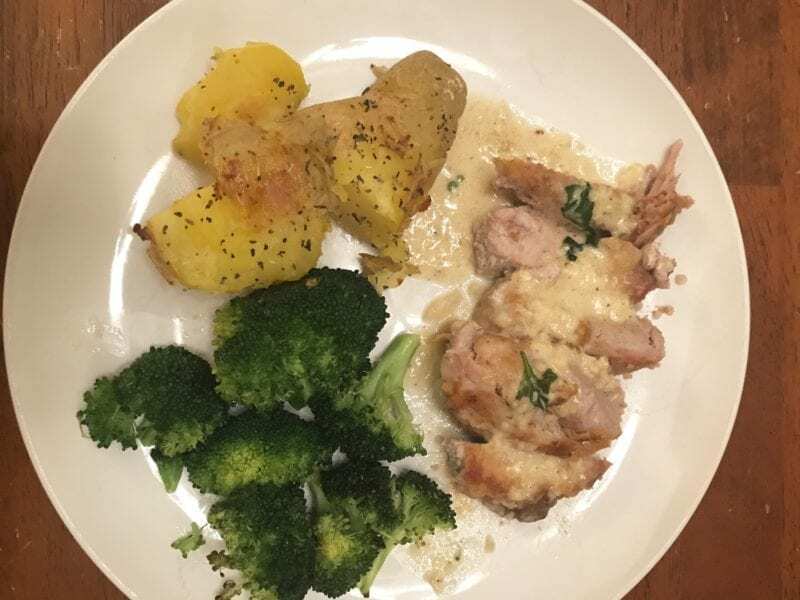 Dinner: Pork chops with basil cream sauce, smashed potatoes, roasted broccoli. My daughter added Parmesan cheese to the broccoli. Treat: Lara bars and mint tea. This was the first day of cutting out added sugar, so I planned ahead to have something tasty and simple as a treat. Breakfast: Peanut butter oatmeal: rolled oats with natural peanut butter added while cooking, plus a drizzle of pure maple syrup, topped with apple slices (this is one of my kiddos’ favorite meals). 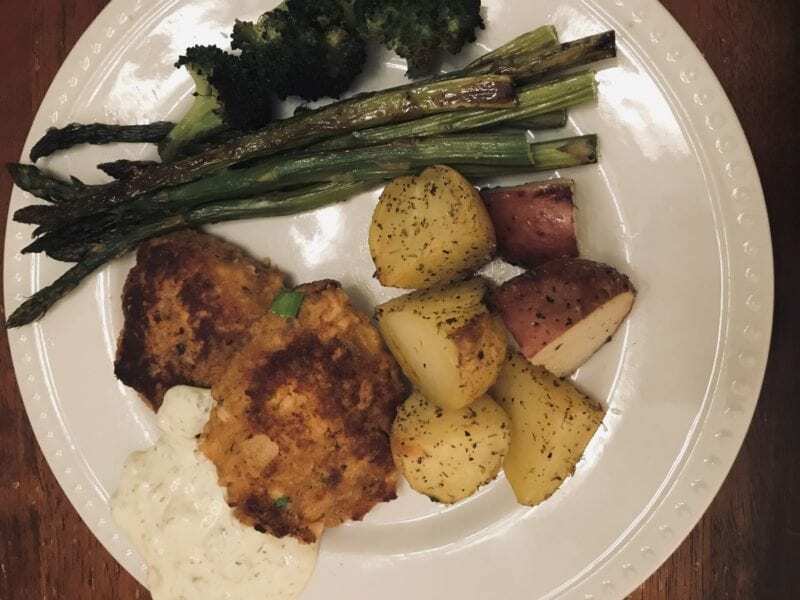 Dinner: Spicy salmon cakes with homemade tartar sauce, garlic-herb roasted potatoes, roasted asparagus, and broccoli. My youngest is still not a fan of asparagus so the broccoli was for her. However, she knows that she still needs to try items she doesn’t like, even if it’s just a bite. Treat: Homemade hot cocoa sweetened with maple syrup and fresh whipped cream, homemade triple coconut cookies. It was a cold, rainy day and we were all wanting some hot chocolate. While making dinner, I made hot chocolate with dark cocoa powder, organic whole milk, vanilla, cinnamon, and maple syrup. I used organic heavy cream and some maple syrup to make fresh whipped cream. I also made triple coconut cookies with unsweetened coconut, coconut flour, and coconut oil. They were super crumbly but tasted delicious! Breakfast: Rustic skillet with leftover garlic-herb potatoes, scrambled eggs, sautéed spinach, and cheddar cheese. When I make roasted veggies and potatoes for a meal the night before, I try to make extra so I can make a skillet meal for breakfast. My family gobbled up all the roasted veggies so I added some spinach this time. I made breakfast and then went upstairs to finish getting ready. I came back downstairs to take a picture, and the food was gone! 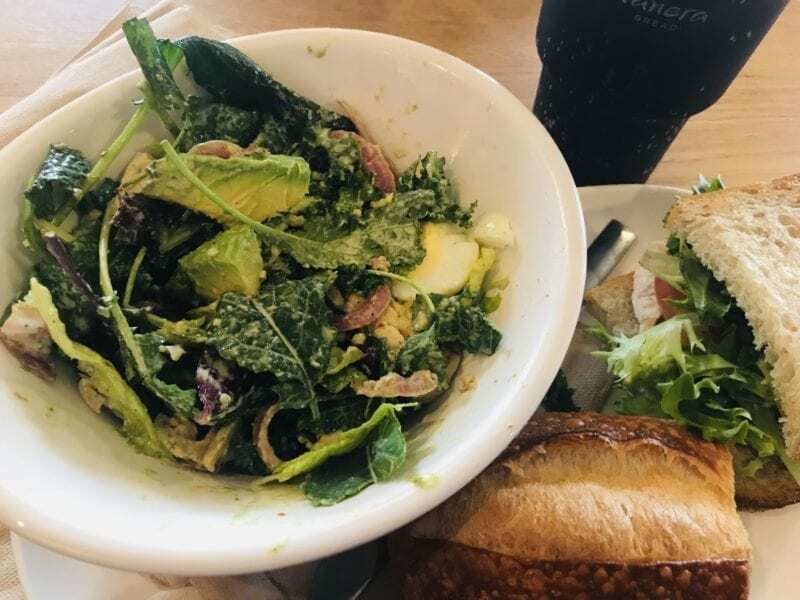 Lunch: Eat out with colleagues at Panera Bread: Greek goddess salad, turkey BLT with avocado. I rarely get to have a long lunch or eat out during the work week, so this was a treat for me. One of my friends is vegan so our restaurant choices are limited. Panera is a great fit for all of us. Dinner: Whole-wheat pasta with homemade marinara sauce, Caesar salad with homemade dressing. My daughter made this meal, and the kids ate before I was able to get home from work so I didn’t get a picture of the meal. Snack: I was hungry after dinner so I had an apple from our CSA box and a square of Parmesan cheese. The kids had homemade trail mix. Breakfast: Homemade granola, organic plain Greek yogurt sweetened with maple syrup, topped with berries. Lunch: Whole wheat organic sandwich thins mini cheese pizzas, popcorn, sliced cucumbers, banana, and mandarin oranges. This was my youngest daughter’s lunch for the week. We use the sandwich thins to make mini pizzas since it’s less bread and they get nice and crispy. They’re good even cold from the lunchbox! Dinner: Organic teriyaki chicken over coconut rice, sautéed baby bok choy, and radishes. We received the bok choy and radishes from our CSA box. I’ve roasted radishes before but have never sautéed them. They paired nicely with the bok choy. I like the flavor and texture better sautéed rather than roasted. My vegetarian daughter had mushrooms and cashews instead of chicken. Breakfast: Breakfast bars: I used the leftover dough from the coconut cookies earlier in the week and added mashed banana, walnuts, and chia seeds. I pressed them in a pan and baked for 20 minutes. My kiddos had the option to top with organic Greek yogurt and berries or have a hard-boiled egg on the side. Lunch: Uncured roast beef sandwich with Havarti cheese, pesto, and pickles, on sourdough bread, side salad, kiwis, multigrain tortilla chips (this is my son’s choice for his lunches this week). Dinner: Breakfast for dinner: Green chili egg bake, green salad, bacon, sweet potato home fries. This egg bake is adapted from a diabetic cookbook. It makes a 9 x 13 size pan, and we cut it up and freeze individual portions. You can add any cheese or meat you’d like. We usually make it vegetarian, but we had family over for brunch recently and made a bacon, gruyere, and caramelized onion egg bake that tasted very close to the bacon and gruyere sous vide egg bites I sometimes splurge on at my favorite Starbucks. Breakfast: Leftover egg bake and fruit. 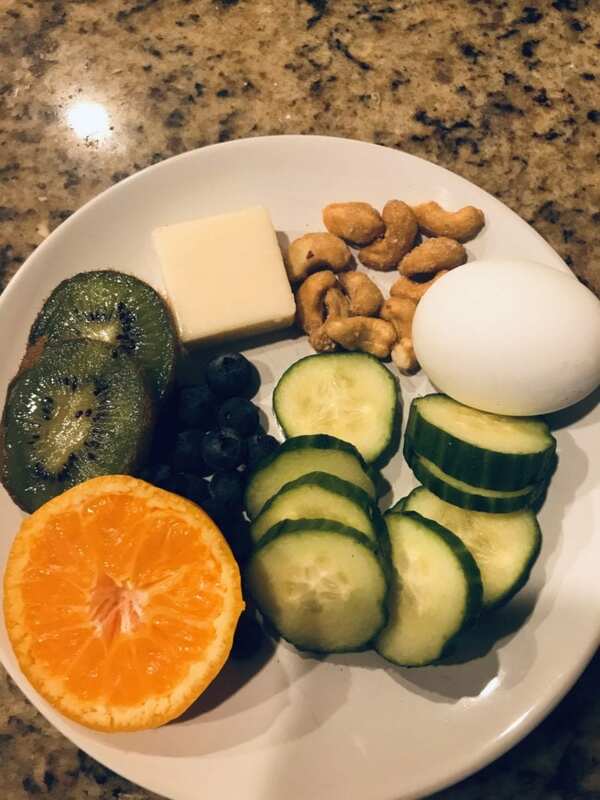 Lunch: Snack box: cheese cube, seedless cucumber slices, hard-boiled egg, blueberries, kiwi slices, mandarin, cashews. Dinner: Split pea soup topped with ham, Cobb salad, cheesy biscuits made with almond flour for lower carbs. The soup is made with vegetable broth so it’s vegetarian and then we top it with ham for all the meat-eaters! I replace whole wheat flour with almond flour for the biscuits, and it holds together fairly well. If there are any leftover biscuits, I save them for breakfast or snacks. Our journey is far from over, but I think we’ve made great progress over the last year. The next step is to add another vegetarian dinner to our weekly rotation and to plan meals more efficiently so that I can double, or triple, recipes and have much more variety in the freezer. I think my advice to any family who would like to eat real food is to tackle one small area and do it well, then move on to the next challenge. I think that every day we try something new and beneficial, we should be proud that we’re making growth toward health! Very inspiring!! I’m glad the whole family was on board. And I loved that the meals were simple but delicious and catered to everyone’s different needs. Thank you for sharing. Fabulous story! Thank you for sharing and giving me ideas to try with my own family. Good luck as you continue! Love this story. Thank you for sharing! All the food looks delicious :) Recipes??? Jennifer- I’m coming to your house for Breakfast, Lunch, Dinner and Snacks!! I especially want to try the breakfast bar you made. Everything sounds great. You have inspired me to get back on my real food challenge. Congratulations on all the success! Keep it up. This story is a true testament to possibility. I might get easily overwhelmed with all the different diagnoses and food preferences (and working full-time), but WOW you made it work! I especially love that each kid had the opportunity to plan for themselves, right down to the shopping. The skills they are being taught will take them far. Thanks for sharing so many details of such an amazing and inspiring story! I love reading these stories on the blog. It is so inspiring to reading someone’s story. Jennifer, thanks for sharing your journey and being an inspiration for the rest of us!